The cause of the disease in budgies can be a miteKnemidokoptes and type. Tiny mite usually lodges in the upper layers of the epidermis of the parrot around the eyes, beak, legs and cloaca of a bird. 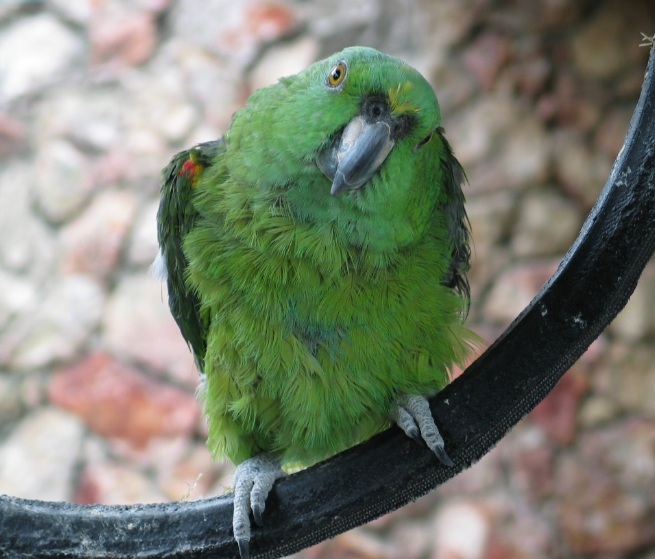 Some mites can cause severe itching of the animal, and spongy growths on the face and legs of a parrot. In special pet stores and veterinary pharmacies, a large selection of various means against the mites and parasites in General. However, one should be extremely careful when choosing medication as a means toxic to birds and can cause an allergic reaction or even poisoning. Experts recommend to buy as a therapeutic agent against mites aversektinovaâ ointment. The advantage of this drug include low cost, ease of use, a rare number of procedures and minimal risk of allergic reactions in birds when used correctly. Aversektinovaâ ointment should be applied to mite affected places with a cotton swab a very thin layer. Avoid contact with eyes, nostrils, beak and tail pparrot. The procedure was repeated every five days and usually lasts four treatments for full recovery. Use better ointment at the time when the bird is less active or sleepy. If your region is hard to buy this stuff, don't worry. A good substitute will serve as the available mineral oil, which should be treated with a mite affected areas. Mineral oil can block the access of oxygen to the mites, thereby contributing to its destruction. However, the oil may not affect the eggs of mites, so it is possible relapse of the disease. For the same reason, the treatment of white oil takes much more time. Oil is usually applied twice a day until complete recovery. This is done as neatly as with the aversektinovoy ointment. At highly advanced stages of the disease should still use aversektinovaâ ointment. Before starting the course and after its completion, conduct a thorough disinfection of cells. After that you should throw out all wooden accessories cells, as they can contain the eggs of mites and other parasites. The source of the tick can be of substandard food, brought from the street, the greens, or did not pass the processing accessory cells.